Hormones and other micropollutants adversely affect health when residues enter the body via drinking water. Widely applicable solutions for removal, however, are still lacking. 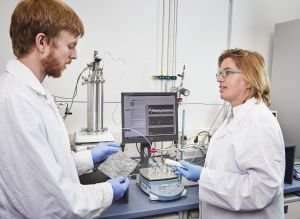 Karlsruhe Institute of Technology (KIT) has now developed a method by which hormones are eliminated from wastewater rapidly and with a high energy efficiency. The results are reported in the Journal of Hazardous Materials. "Contamination of municipal drinking water with micropollutants might become one of the biggest challenges for the protection of our health and the environment," says Professor Andrea Schäfer of the Membrane Technology Group of KIT's Institute of Functional Interfaces (IFG). The expert and her team study removal of the hormones estrone, estradiol, progesterone and testosterone. Their concentration in one liter of water, into which treated wastewater is discharged, is about 100 nanograms. "We are searching for the needle in the haystack," Schäfer says. "Still, these hormones at these concentrations are highly effective." The low concentration and small size of the hormone molecules do not only impede detection by analytical methods, but also removal. The new membrane technology method combines the advantages of adsorption (binding) of micropollutants by an activated carbon adsorber with those of ultrafiltration of pollutant particles by a semi-permeable membrane. In the integrated system, the wastewater is first "pressed" through a polymer membrane in which the microorganisms and larger impurities are retained. Behind this membrane, a layer of special activated carbon is located, which originally was developed for air filters. Its surface has a high affinity to hormones, which means that carbon and hormone molecules readily form new compounds. Moreover, the activated carbon can be passed by large amounts of water and bind many molecules. The energy needed is far smaller than that of alternative methods, such as reverse osmosis. "The special configuration of activated carbon and a polymer membrane is water-repellent, ensures a high water flow rate due to the large specific surface area of the carbon particles used, and works rapidly and energy-efficiently," Schäfer summarizes the advantages. The adsorption layer has a thickness of about two millimeters and, hence, is extremely thin, but removes hormone molecules at realistic concentrations. Laboratory experiments have shown that 60% of the hormone pollutants can be eliminated at a water volume of nine liters and a very small membrane surface of 38 cm2. Depending on the thickness of the adsorption layer, this value can be increased to 90%. "We think that we have developed a viable technology for the elimination of micropollutants and hormones from water," says Matteo Tagliavini, who works in the group of Schäfer as a doctoral researcher and is co-author of the recent publication. The composite membrane is flexible and can be applied in various modules. It is suited for use in large industrial facilities as well as for applications on smaller scales down to the tap at home. Practical use of the new method is facilitated by the fact that the material has already been approved. The first industrial project is being planned at the moment.